To hear Jenny’s 8 minute radio interview about hypnotherapy and why she does it, click here! A colleague posted a link to this article on Facebook and I thought it was good info to share here as well! Let’s try to keep our kids off of pharmaceuticals as much as possible! I’m also available to speak to organizations at dinner meetings, conferences, workshops, retreats, and the like. I can come to your small to medium-sized business to speak to employees about the power of the subconscious mind, social-emotional learning skills, essential oils, and other related topics that involve naturally and safely renewing peace and balance to people’s lives! Email or call me to set something up! Journey to the Stage book! I’m excited to announce that I have just been published in a wonderful book entitled Journey to the Stage. Along with some fellow entrepreneurs and speakers, I was invited to contribute to this book to provide inspiration, tips, resources and a message from the heart about stepping up and stepping out to share our message. The Kindle version is available now for just 99¢ and the paperback version will be out in just a few short weeks. Go ahead now and grab the digital version by going to: http://JourneytotheStagebook.com. As our way of saying ‘Thanks’ for supporting the digital campaign, several of the authors have added bonus FREE gifts that you’ll get access to after purchasing the digital book from Amazon. I know you’ll enjoy the book and receive great value from it just as I did. Each of my co-authors shared the story of their Journey to the Stage with honesty, heart and a passion for making a difference. Again, thanks for supporting this next step on my journey. I look forward to continuing the journey together in many ways! 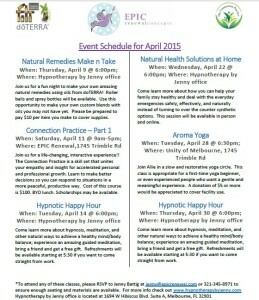 Don’t forget, there’s another FREE Hypnotic Happy Hour with light refreshments, some great info about the power of the subconscious mind, and a mini-group hypnosis session Thursday night, 4/30 at the Hypnotherapy by Jenny office at 1694 W Hibiscus Blvd, Suite A, in Melbourne. Refreshments start at 5:30, the program starts around 6. 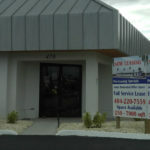 Hope to see you there, please RSVP by calling 321-345-8971 or emailing jenny@epicrenewal.com so we have enough seating. If you can’t make it to this one, keep checking the Community Calendar on this website for when the next one will be. Why is Hypnotherapy so powerful? 90% of what we do is driven by what’s going on in our subconscious… The autonomic nervous system (within the subconscious) is what controls things we don’t have to think about, like: heart beating, breathing, digestion, perspiration, salivation, wound healing, cell regeneration, etc. 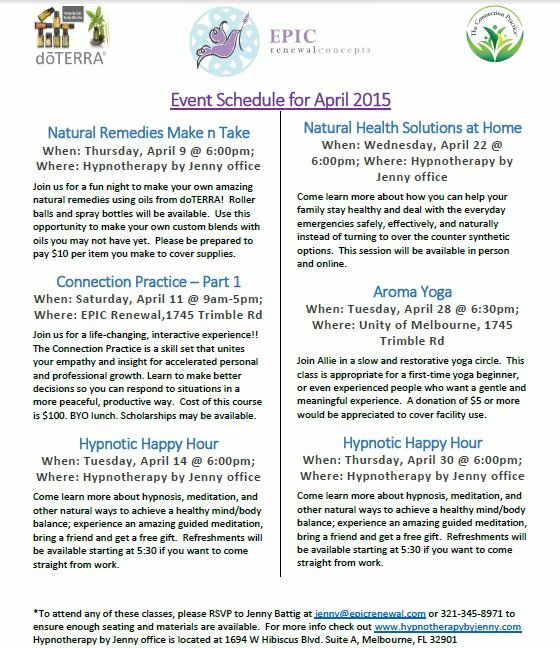 Sorry for the delayed posting… we’re now incorporating a wider variety of events on the monthly schedule. A new monthly recurring event will be Hypnotic Happy Hours for people who are curious about hypnotherapy and would like more information and a quick demo before deciding if it’s something they want to pursue. We’re looking forward to sharing more information with people to help them make the best decisions for natural ways to improve their health and happiness! Check back each month to see our schedule of information sessions and other related events!